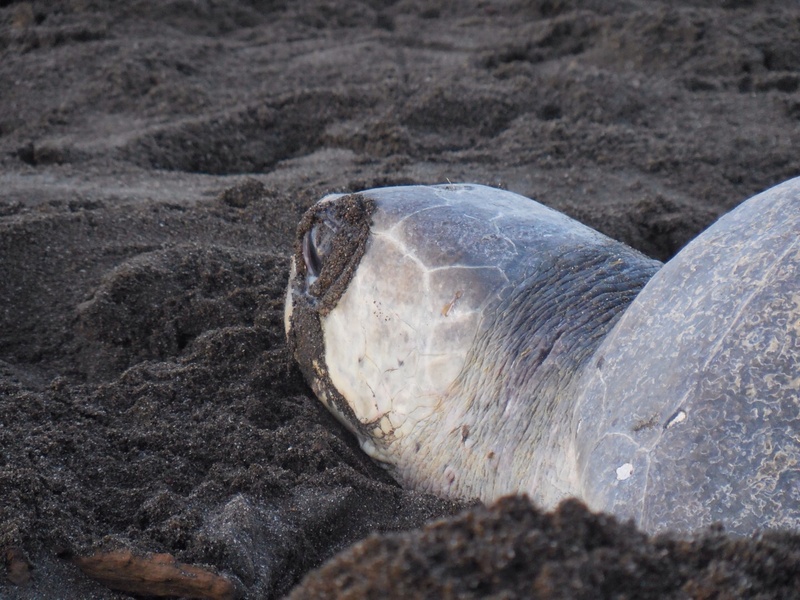 OSTIONAL, Costa Rica – What does it take to dedicate your life to the preservation of another? According to Wendy Cruz, director of the Estación Biomarina Arribadas in Playa Ostional, the answer is love. If Cruz’s size was proportional to the amount of caring inside of her, she would tower over Shaquille O’Neal. Instead, the overflowing love is crammed into her shorter frame, bouncing out of her curls and smile with every word and action. Though some might complain about the overwhelming humidity in the Costa Rican beach towns that makes each movement a struggle, Cruz simply sweats happiness. She accepts the constant assault of mosquitoes and invading sand from the beach, quite content in her home away from home. Cruz, age 43, runs a small school in her albergue, or lodge, near the beach, educating between five and 40 students at a time alongside volunteer professors who teach various subjects such as economics, biology, geography and most importantly, about the sea turtles that regularly emerge from the ocean to lay their eggs on the beach. But Cruz hasn’t always been focused on the life of the turtles and conservation education. In 1993, she earned a degree in economic sciences from the Universidad de Costa Rica and started her own consulting business. Tragedy was necessary to bring her to Playa Ostional to realize her passion. When her parents were caught in a flash flood on the road to Ostional and killed six years ago, Cruz left her home, husband, and two children in San José to take over her parents’ work. 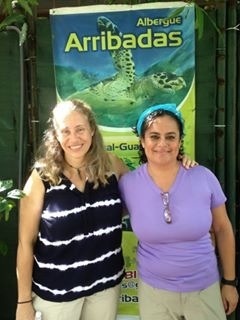 Since 1993, Edgar Cruz and Sonia Sevilla had been trying to establish a large station in Ostional to learn and educate others about the turtles and sustainability. Coming to Ostional was not easy for Cruz, not only because she had just lost her parents – Cruz was pregnant and due any moment, and coming from the city life, was having a hard time adjusting to the “eternal Saturday” coastal culture. Caught up in her grief, she felt cut off from the world, and was only saved by the arrival of the turtles. The turtles’ arrival helped Cruz adopt a sort of “turtle philosophy” – a way of looking at the world with love. And survive Cruz did. Fueled by her newfound passion for the turtles and her desire to carry on with her parents’ project, and seeing the need to educate people, she sought out information wherever she could find it. Eventually this path led her to María Teresa Koberg, who was influential in the establishment of El Parque Nacional Marino Las Baulas and the protection of the leatherback turtles. Though Koberg, known as Teté, was dying, Cruz still approached her for help. In her failing health, Tete gave Cruz piles of books to read and learn from – Cruz calls them her “turtlecologist bibles.” Cruz was in demand to teach “from day one,” so she had to read and absorb the knowledge fast. People began to find Cruz and her small school via social networks, and she started to educate all who came to her. She recruited volunteer professors to educate teens to toddlers on marine biology, anthropology, art and history. Cruz developed a class on sustainable economy, which she continues to teach. Cruz especially feels that way about her own children; though she does not wish to impose her dreams on others, she thinks that because her children have seen the beauty of Ostional, which “is like heaven to them,” they will be inspired to pursue conservation work. No matter what they choose to do, however, Cruz will support her children, who she calls her three baby dragons because they had to grow up strong without her around all the time. “They had to defend themselves in school without their mommy,” Cruz said. Initially, it was hard for Cruz to be separated from her family, but as the years have passed and more volunteers have come, lessening the load on her shoulders, she and her husband have been able to organize more time together. This is much appreciated by her kids – as shown by the excited cries of “Mamá! Mamá!” and the patter of running feet when she returns home. Just as her parents taught her, Cruz teaches her own children and students what she believes to be one of the most imortant things: a love of nature. On a short excursion to go tidepooling with a group of journalism students, Cruz did not simply peer into the water, searching for creatures; with no hesitation, she sat down in a shallow pool, immersing herself in that world. Completely comfortable amidst the sharp, cutting lava rocks and gentle, salty waves, she admired the tiny violet fish who came to investigate her. Along with the respect and caring for the environment she wants her students to have, Cruz wants them to understand how they impact nature. People produce trash, but do not always acknowledge their trash and the damage that it causes, as well as their “trash mentality” of excessive consumption. Propped against a wall in her lodge is a board covered with litter Cruz has found on the beach, serving as a constant reminder of the harm that humans are capable of. Now, six years after she started teaching, Cruz is filled with pride in her students, many of whom have taken her teaching to heart and tried in their own ways to share the knowledge. The dream that Cruz’s parents had for Ostional has started to become a reality, though a lack of trained teachers keeps her from establishing the large station that was her parents’ goal. The locals have embraced ecotourism and are better trained in guiding and informing tourists, and are more knowledgeable about living sustainably. Cruz is now an influential conservationist and teacher, touching lives both human and animal, inspiring people to think before they pollute, and above all else, loving.